Just last week, a new "Planet of the Apes" movie hit the theaters. It is a movie that I was not going to miss and wait to come out on DVD. I loved "Rise of the Planet of Apes" and went to the theater hoping that this movie, "Dawn of the Planet of the Apes" would be just as good - or even better. I might add that I have always been a fan of all of the "Planet of the Apes" movies in the past. From the original 1968 Charleston Heston movie series, to Mark Wahlberg's 2001 remake up to the 2011 release of "Rise of the Planet of the Apes" - I can honestly say I am a fan! We catch the 5:30 show and are stuck in the very front row of the theater. I can't take this! We talk to management and they give us tickets to the next showing at 6:30 for $3 more per ticket because it is in 3D. "Dawn of the Planet of the Apes" starts and we are reminded of the human killing virus that has spread amongst humanity at the end of the last movie. Apparently, a good percentage, if not all of humanity has fallen victim to the disease. We then see Caesar and the rest of the apes living their life in the jungle area called Muir Woods that they inhabited at the end of "Rise of the Planet of Apes." Caesar, happy with his life, still wonders about humans as the apes have not seen a human for ten years. Caesar, knowing that humans can be cruel, still has love for humans as he knows there are good ones such as Will Rodman, who raised him. Blue Eyes, Caesar's son, and another ape named Ash encounter some humans while in the forest. One of the humans panics and injures Ash by shooting him. A cry for help soon as thousands of apes surrounding the humans. A man named Malcom, tries to keep peace with the apes and Caesar yells and orders the humans to leave. We learn that the humans who are alive live in San Francisco in a guarded tower and that they are immune to the virus. Koba, an ape who dislikes humans, tells Caesar that they must attack the humans before the humans attack them. Caesar does not, but instead takes an army of apes to the human dwelling and lets them know that the apes do not want war but that they will defend themselves if they need to. He also tells them to stay in their area and the apes will do the same. The humans need a hydroelectric dam in the apes territory to provide long term energy to their city and Malcom takes it upon himself to go back to ape territory to tell Caesar what the humans need. Macom goes back with a small crew of people and is roughly taken to Caesar by other apes. At first, Caesar does not like the idea but eventually gives in and tells Malcom to do what he needs to do and then leave. Malcom grows on Caesar and vice versa. After the job is completed, there is celebration going on but then Koba shoots Caesar and blames humans for doing it. His intention here is to start a war with the humans as he is not happy with Caesar's love for humans. Malcom and his group are able to run and get away. The apes then attack the town killing and enslaving all of the humans. Koba also chains up all apes that were seen as having too much loyalty to Caesar. Koba even goes as far as killing a fellow ape named Ash after citing Caesars teachings. Malcom and his friends find that Caesar is still alive and drive him to his former home were he was raised by Will Rodman. Caesar realizes and confesses that apes are no better than humans. Malcom goes to the city so he can get medicine to help Caesar and runs into Blue Eyes, who spares Malcom's life. Malcom tells Blue Eyes that his father is still alive and takes him with him to the house. Caesar tells his son that Koba shot him and that it was not the humans. Caesar also reminisces about his past as he finds a camcorder in the house with video clips of him as a young ape with Will. This was the saddest part of the movie for me. Blue Eyes goes back to the city and starts freeing the humans and the apes that are loyal to his father. The loyal apes then join with Caesar and confront Koba. Meanwhile, Malcom reports to his superiors and they tell him that they have made contact with other survivors up north at a military base and that they are on their way to help fight the apes. A fight for power between Caesar and Koba develops and Caesar wins the battle. With Koba hanging for his life from a ledge, Koba tells Caesar "Ape shall not kill ape." Caesar responds by saying "You are not an ape" and makes Koba fall to his death. Malcom then tells Caesar about the human reinforcement that is on the way to fight the apes. He tells Caesar for him and the rest of the apes to go back into the Muir Woods. Caesar, being the intelligent leader that he is, tells Malcom that humans will never just forgive the apes for attacking. He tells Malcom to leave with his family to a safe place. Caesar and the rest of the apes then knell down waiting for the battle to come. It is a war that Caesar never wanted, but unfortunately it is one that he will have to lead and fight. The movie ends here and leaves us anticipating the next movie. 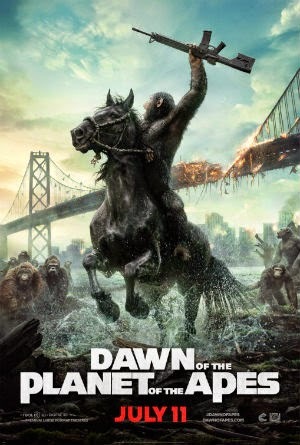 "Dawn of the Planet of the Apes" was an excellent movie that would be impossible to not enjoy. I really liked that it did not leave Caesar's roots out of the movie. It was a bit sad when you see Caesar looking at Will and himself with the camcorder. When Malcom asks Caesar who Will was, Caesar tells him that he was a good man just like him. The movie has lots of action, is sad sometimes and believe it or not is even funny at certain parts. There is a part in the movie when Koba runs into two humans. The humans pull our their guns, but Koba starts acting like a goofy and clowny circus ape to ease the humans. He starts doing tricks and flips to amuse them so that they can lower their guns down. This is funny coming from the ugly all mighty Koba. Of course, when close enough, Koba takes them out. I would also like to say that if the 3D show is available, it is well worth it. Like I said, I kind of got set up into watching the 3D version of the movie, but I am glad it happened. Overall, this movie was great. Was it better than the first one? I'd say it was about even. Just a bit different as we see more intelligent and independent apes.